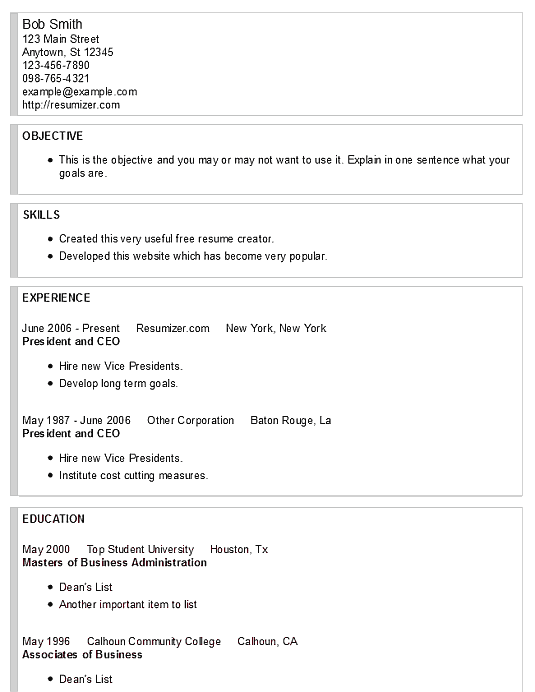 If you like things to be organized, then you will like this resume template with its colored borders. Each section is divided by a border so there is no question which section is which. Your career information is neatly isolated and organized, there won't be any confusion about to which section your facts are pertinent. Use the proper keywords to focus your facts for the job even more. Colored Border Template number nine is similar to number eight with the difference being the borders of course and the section titles not having underlines. The rest of the layout is the same, the order of the names, the addresses and the details in all areas. The fonts and font sizes are also the same. If you liked style eight you may like this one better and vice versa. Within the Free Resume Creator program you can both download this template and also select the color of the borders on the "Colors" page, it is the "Accent Color" setting. When using any template be careful to spell your words correctly, use proper grammar and incorporate action verbs into your writing. The first impression the interviewer will get from you is from what they will read from your resume. So make it your mission to observe proper writing techniques it could be the tie breaker the interviewer needs to choose the best of two candidates.